We gathered for you a few interesting dances performed during the Christmas season around the area of Brasov. So if you see these on the streets of the city, feel free to join in! The young lads’ dance – On the 25th od December, the first day of Christmas, the young men of each community attend church dressed in national costumes, and there they carol the people arrived for the religious ceremony. On the second day of Christmas, the group of lads starts the dances. All these young men have to invite to dance each of the girls attending, and in their turn, each girl that has entered the dance at Christmas cannot refuse any man that wants to invite her to dance throughout the rest of the year. The goat dance – The goat is represented in many carols as she is a goddess in a zoomorphic body. She is represented by a mask worn by the young lads in the groups. The ceremony performed in this dance represents her death and rebirth at Christmas time. That’s why the dance is usually very agitated and is accompanied by a lot of noise. 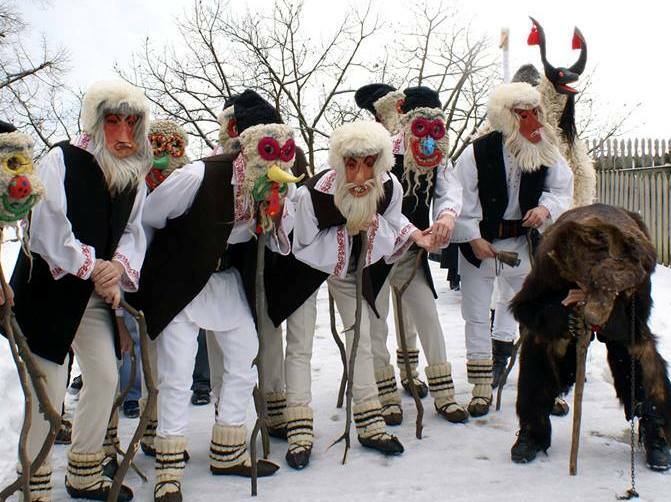 The goat dance can be met almost everywhere in the Brasov area. Similarly, in other communities there is the stag, which is a substitute for the solar god. The “Bear dance” is very famous as well, the bear representing the animal-king of the mountains. A lot of people consider that the bear dance is the most spectacular of all the dances with masks. Dancing with a bear mask symbolizes the death and the resurrection of nature. In the ceremony, the animal dies and is then resurrected, performing a symbolic dramatization of the myth of rebirth of nature or of the cosmos. Thus, the rolling of the bear in a circle, its beating, its death and then the resurrection, all these symbolize the metaphorical passing of the seasons, which stood at some point under the sign of this animal. The bear was the only animal able to defeat winter and welcome spring. It is said that during the New Year, carolers wearing the bear mask banish demons from households, and wish a happy new year for the families living there. Usually, all of these carolers perform first on the streets, and after they go to people’s houses. There, they are awated with enthusiastm especially by the young ones, wich also recite poems in return. If you are curious in finding out more winter traditions and customs from the Brasov area, check out our article!